St Paul's Wort is a small annual herb, growing up to 2-4 ft tall. Stem and branches are velvety, purple. Oppositely arranged leaves, 5-10 cm long, are triangular-ovate, sharp tipped, with toothed margin. 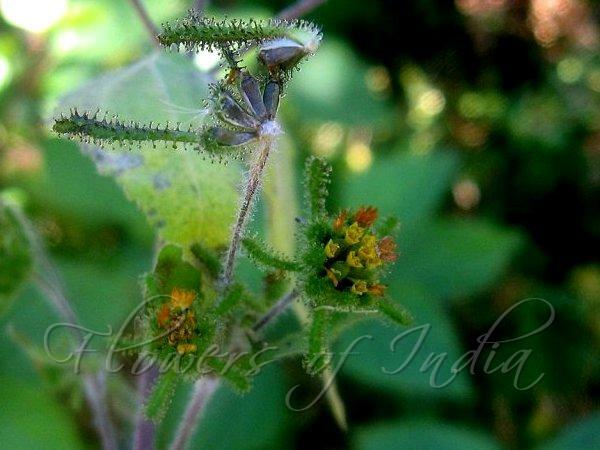 The flowers heads are small with five bracts just below them, which are covered with very sticky glandular hairs. The secretion continues till after the fruit is ripe and aids in its distribution - the whole flower-head breaks off and attaches itself to some passing animal. The flowering heads are yellow, small, somewhat rounded, and 5-6 mm in diameter. The ray flowers are red beneath, very short, curved back, and 3-toothed. The achenes are each enclosed in a boat-shaped bractlet which is hairless but slightly rough. 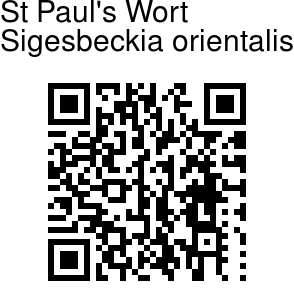 St Paul's Wort is found in India at altitudes of 400-2700 m. Flowering: October-November. Identification credit: Navendu Pāgé Photographed in Mussoorie & Dhanaulti, Uttarakhand.